Last week I shared last year's summer sunroom and this year's sunroom has had quite a few changes. I'ts a mix of styles so I'm calling it my eclectic summer sunroom. This year it's a lot simpler with less decor. It's still decorated in shades of blue because what's cooler than blue and white? I just love this combo and in hot Georgia we need all the cool we can get. The sofa, wicker chairs and the tall chest were in here last year, but the other chairs, coffee table and end tables have changed. So let's tour this summer's look. Navy ticking pillows with cute ruffles add a bit of French flair on the slipcovered sofa. These pillow covers are just like the brown ticking ones in the summer great room I shared last week. A bit of bohemian flare is added with the marching elephants pillow purchased from One Kings Lane months ago. Simple styling on the coffee table with an old seagrass basket filled with favorite magazines, freshly clipped hydrangeas and a candle. I put the large lamps that were in the great room in here after getting the new lamps for the sofa table in the great room. See the green leaves through the window? I love the way this room feels like it's in the trees in the warmer months. The patterned curtains add farmhouse style. 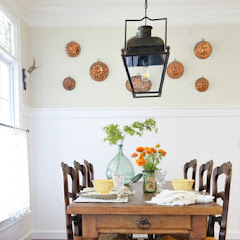 The stacked vintage lidded baskets that served as the end table last year have been replaced with an old trunk. This trunk was one of my first antique junk finds back in the seventies. I brought my large crock in here and filled with some of my magazines. The blue Dash & Albert rug was a good purchase I made a few months ago after the other rug was just so stained and matted. The wicker chairs add a bit of coastal style. I removed the little cabinet I had on this chest and added this print that used to hang in a guest bedroom. The round end table has been painted since last summer. The leather chair was purchased since last year, too. I do wish Pottery Barn would deeply discount this chair again so I can get another one. I lucked up on a flash sale last November and got it for fifty percent off. This is how it looks most summer days with the fan on full blast. That's my eclectic summer sunroom. Update on Miss Bailey: she is doing quite well and is so glad to be home. so glad to hear that Bailey is back home...hanging in this gorgeous room. Happy to hear that Bailey is home and feeling better. 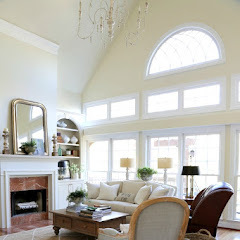 Love the sunroom...so beautifully refreshed for the summer months. Love those new pillows....perfect! Such a pretty room, I love the new rug too. So sorry about Miss Bailey. It is so hard when our pups are sick. 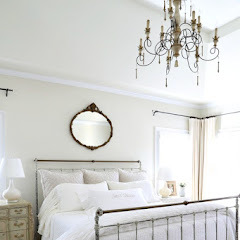 Love the changes in this room, it looks beautiful! That room!! It changes and changes but it's always amazing. Sweet little Miss Bailey - I'm glad she's better. So glad your Bailey is better! I love this cool breezy room. Feels just like summer. It's just beautiful, Kim! Love the lighter colors! So glad Miss Bailey is home to snuggle in this room!! I think your sun room is my favorite room in your house. You change it up often and it is always fun to see what you do. Hope Miss Bailey is doing well - she's such a little cutie! Your sun room is very pretty, but I loved the pops of red -(especially the curtains you had up formerly). The room seems more monochromatic now, but yes, very soothing. You must have fun changing up so often!! Love it. I feel in love with the white bowl with the blue stripes. Oh my, I so need that. I finally purchased the dog print, now I just have to hang it. That bowl is a vintage ironstone bowl and I'm so glad you got the dog picture. Very cute! I love the elephant pillow! I hope you and Miss Bailey are healing quickly! Love the room! Would you share the source for the wicker chairs? Kim, I am in the market for a bench like the one under your sofa table...where did you find yours? Denise I answered this on the other post and I hope you come back for the answer since your comment reply is not linked to your email. It is several years old and may have come from Ballard's, but I think it was from Joss & Main. I probably bought that five or six years ago and I painted it since then. It's so pretty. All those windows. I would be in here 24/7. Very pretty and serene, Kim! I must have missed you getting that coffee table. Hope Bailey is doing better. I am glad to hear Miss Bailey is feeling much better and is at home. The sunroom is beautifully dressed for summer. I am loving the wicker chairs for their great texture...eclectic suits your space! Beautiful room! I love all the changes you make to the sunroom each year. I love the calm simplicity of your new look. So happy to hear that sweet Miss Bailey is home with you now. Hope she's doing much better. Love the "summer" room and love ALL of the changes you do in there! What fun! So thankful that Bailey is back home and doing well! Such a light and airy room. I bet that just sitting in there makes you feel happy. I especially love the patterned curtains and your lamp. Love this room! I'm struggling to incorporate blues in our new-to-us home because my husband prefers blue...this is ideal for me! Not over the top and very comfortable! 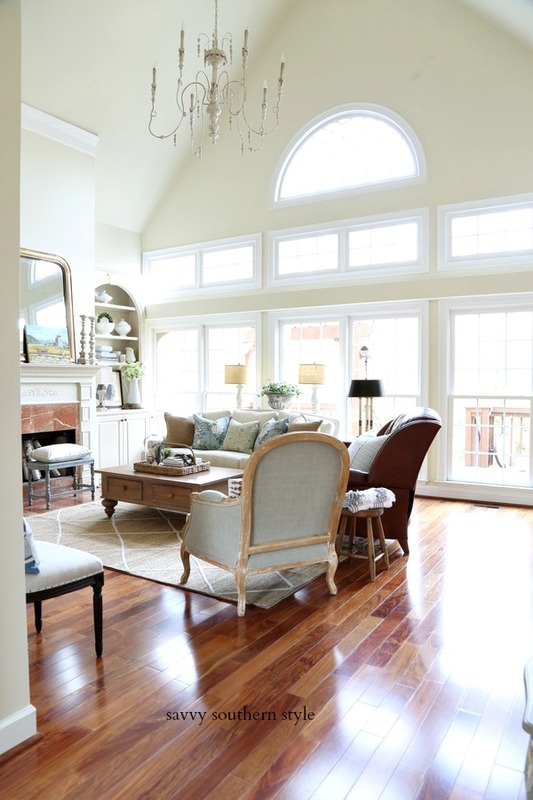 Eclectic or not, your sunroom and your entire home is always smashing! Can't wait to see it again in a magazine! So I noticed the curtain rods are only (about) 3/4 of the length of the windows...is that a new trend I'm not aware off??? Your is room is very inviting! 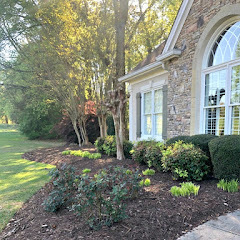 They are only for looks to soften the hardscape and add some color. They aren't used. Great news about Miss Bailey! 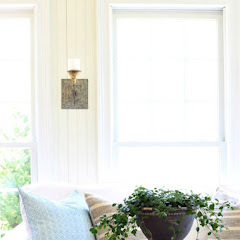 Love your summer sunroom and your new rug! What a lovely room. And it sounds like it gets a lot of use. Enjoy! Beautiful sunny room and I love all the blue! I especially love the blue color on the round table. Would you share the color? That is actually black. It's Graphite Annie Sloan chalk paint. so chic and happy, kim! I love all that gorgous natural light highlighting all the pretty elements. 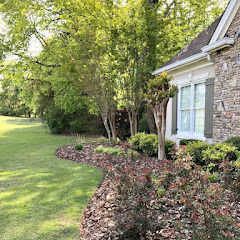 Would love to have you visit my post (http://www.hellolovelystudio.com/2017/06/5-tips-to-add-instant-curb-appeal.html) if you have a moment. Peace to you right where you are. Very refreshing! I am researching the perfect woven wood blinds for my family room. I love yours. Do you remember where they came from? Also, I love the contrast of light and dark in your room. It is very well balanced. Simply gorgeous! Do you have a source for the upholstered side chair? I've been hunting a pair. I have had that chair several years and I believe it is from overstock.com. It is really very firm.